Working from home is a constant balancing act. 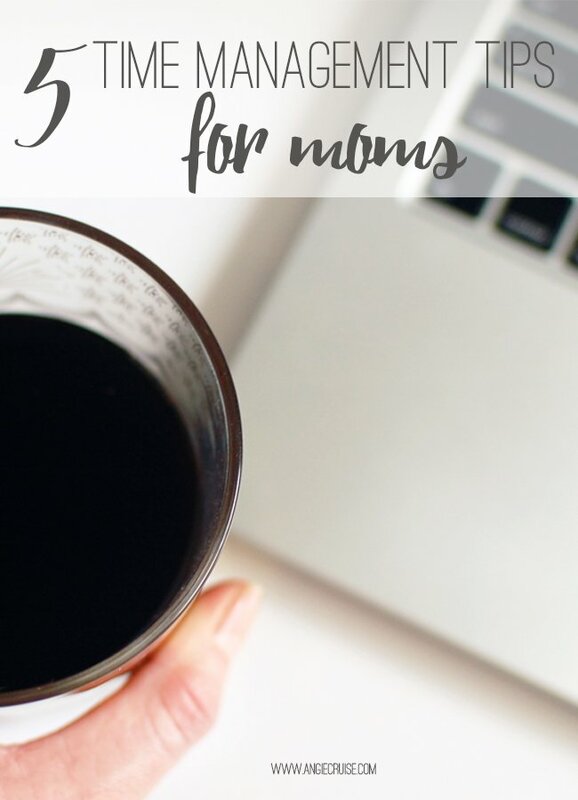 Today, I’m going to share my top time management tips for moms to help you get more done and find the balance you so desperately crave. If your day is anything like mine, you rush around for most of the day taking care of every little thing. Before you know it, it’s 5 pm and it’s time to cook dinner. 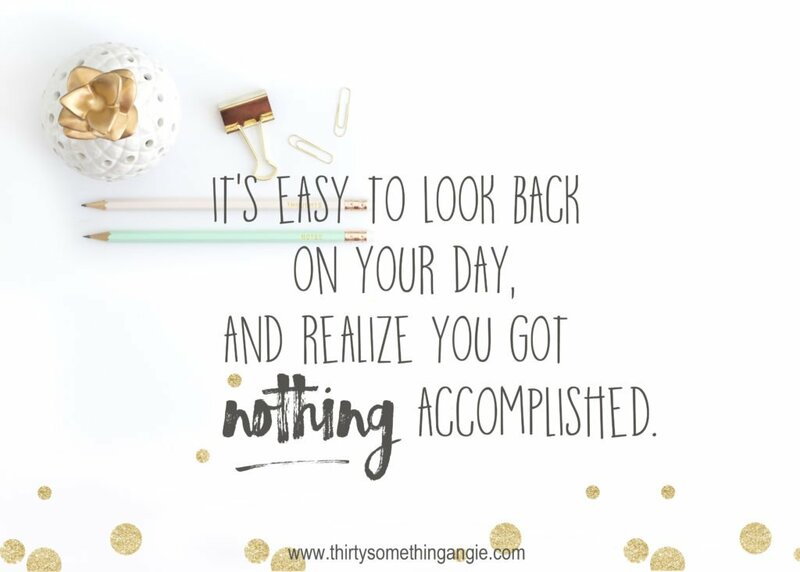 It’s easy to look back on your day and realize that as busy as you were, you got nothing accomplished at all. Over the years, I have learned a few time management tips that have helped me become more productive at home. It doesn’t matter if you work or stay home with your kids. You can learn to get more done each day with these tips. These steps help me determine where to spend the majority of my energy each day. 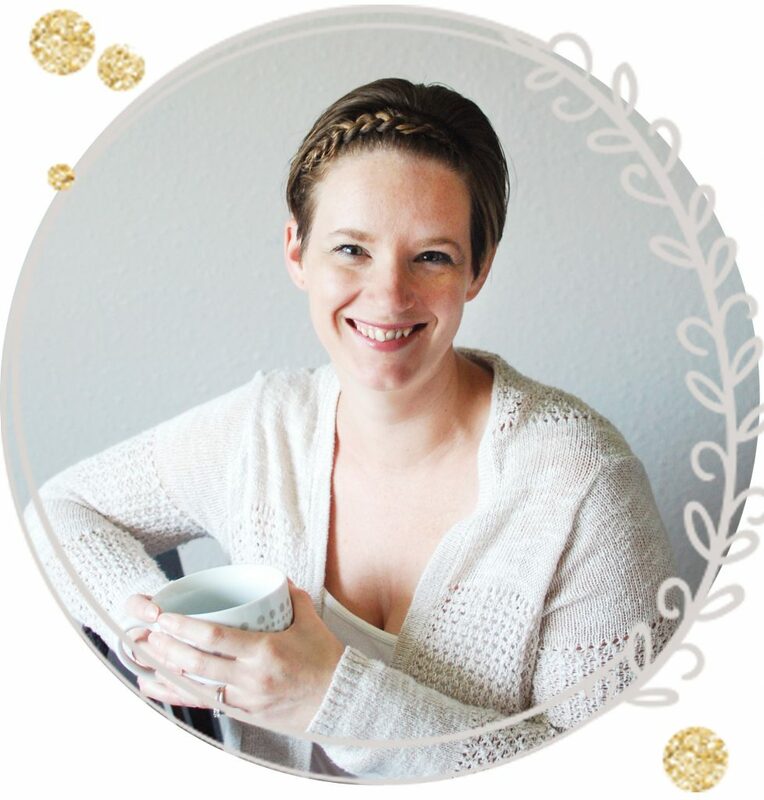 This is how I manage to work towards my goals and move my business forward while raising a toddler and running a family. Goals can come in all shapes and sizes. I personally have some big, scary goals I’m focusing on. These goals are always on my mind when I sit down to plan my day. I’ve identified them, and I’m able to dedicate the majority of my work time to these items. Maybe you just want to put away all the laundry today. That’s a great goal, too! No matter how big or small your goals are, it’s important to identify them. Then, you can start working towards them. Once you’ve identified your goals, you can break them down into the steps you need to do to accomplish them. Write all of your goals and steps down. It takes more time and energy to constantly run through your to-do list in your head than it would if it’s written down on a piece of paper.
. I read it this past weekend and I can tell you, it’s an incredibly helpful book for any mama looking to make better use of her time. There’s a whole chapter on figuring out your true passions, too! Once I’ve got my goals in mind, whether they’re big or small, I take a few minutes to prioritize those goals. Let’s face it. We’re moms, business owners, and so much more. Some days, we can’t meet every goal that we’ve set. It’s important to prioritize your goals so that you focus on the most important things first. I like to give myself 3 “must do” items every day. Items can end up on this list several ways. Sometimes, I have a deadline that I have to meet, so that automatically goes to the top of the list. I also add items to my top 3 if I am tired of seeing them on my list. When I have a few spare minutes to work, I can refer to my top three and really get to work more efficiently. I spend a lot less time checking social media, blog stats, and my email when I have a full to-do list to complete. I know I’m a big fan of a fancy planner, but really, any planner will do! The important thing is that you have a place to write down your plans and events, and that you keep up with it. Your planner is no good if you write everything down and then never reference it again. I like to keep mine open on my desk every day so that I can refer to it regularly. Like this planner sheet? 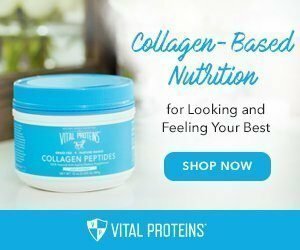 Get yours FREE right here. This is just to give you a basic idea. You can read more about how I use my planner right here and here. That’s right. I said it. I know it seems counter-intuitive, especially to moms, but it works. Despite the very popular advice, I think that multi-tasking is actually bad for productivity. It seems I’m not the only one, either. Block scheduling is becoming more and more popular every year as people realize that multi-tasking can actually make you less productive. Here’s what I suggest. Set aside a block of time for each task. I set an alarm, so I know I’m dedicating the proper amount of time to everything. When you sit down to work, really work. No social media, no phone calls, no email. Log out of everything and just sit down to knock out that one task that you prioritized for this time block. Once the timer goes off, you set it aside and move on to the next task at hand. It’s an incredibly helpful concept for being more productive. By focusing on one thing at a time, you are able to mark more things off your to-do list each day. It feels so much better to wake up in the morning without partially completed tasks to carry over to a new list. I struggle with this one a lot! When I first started working from home, it was hard to make people realize I was busy, too. It was easy for them to ask me to do something for them while they were at work, because they thought I had more free time. It took a long time for me to figure out what was happening (It’s in my nature to serve!). In the end, I ended up running myself ragged and hurt my business because of it. These days, my issue is less about everyone else, and more about me. There are just so many things that are important to me! I’m involved in the school, run a school garden, help with Girl Scouts… Well, you get the idea. I don’t know about you, but this is absolutely me. The thing is, there’s simply not enough time in the day for me to accomplish everything I want to. At least, not without sacrificing somewhere. I’ve learned to identify what my true passions are, and focus only on those things. It’s required some hard choices,because sometimes I have to say “no” to something that’s important to me. Chasing dreams and running a business is a huge commitment, and one that can take a lot of time and energy. Some days it seems like there isn’t enough time to stop and get organized. When you make it a habit, these steps take very little time. If you feel like you’re on a hamster wheel, running in circles and not getting anywhere, you may just need a little organization to help. Follow the steps above and see what a difference they can make in your time management! 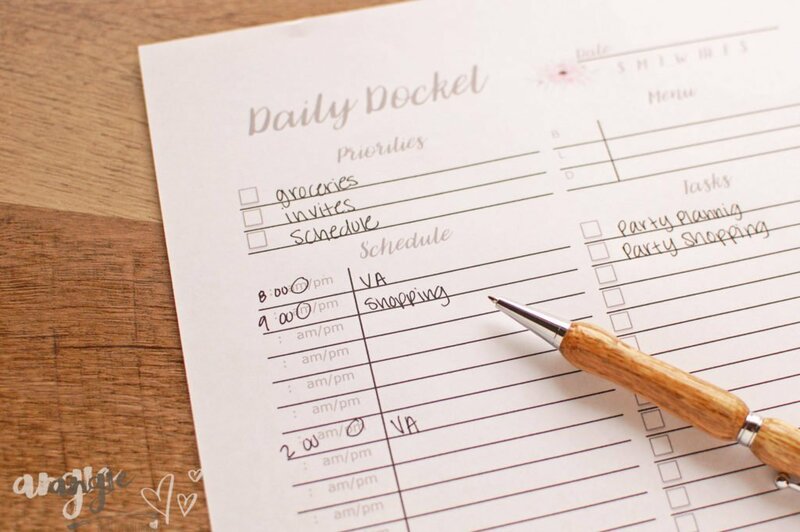 Like the daily docket planner page I posted here? Great news! 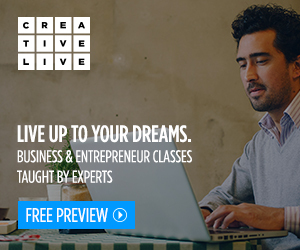 It’s FREE just for you! Grab it here and let me know what you think. Do you have any areas you struggle with more than others? What about tips to share? 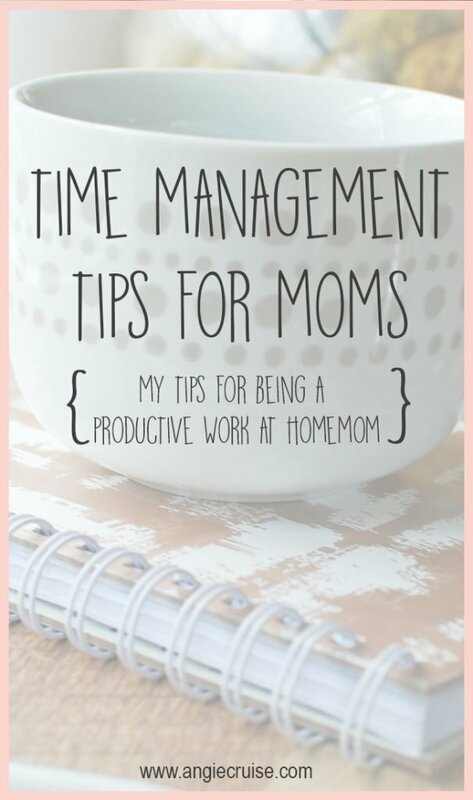 I’d love to hear your best time management tips for moms below! Thanks for the tips! Although, Im a full time working single mom with part time jobs – these tips will defeintely come in handy to keep on track of everything…. My biggest battle is to stop the multi-tasking…. you right in saying you actually end up less productive. Hi, there! You are certainly busy, then, from the sounds of it! I hope these tips can help you, too! I keep trying to convince myself to give goal writing and planning my day a shot and at least see how it goes. I’m pretty sure I will forget I even wrote them or become rebellious to myself, (Yes, that’s a thing!) and refuse to do anything I planned. Haha! It’s definitely a learned practice! I have to leave my planner open where I can regularly see it and I find that that helps me continue to refer back to it! Oops! I am terrible about #4. 🙁 My husband always tells me to stop multitasking but I constantly feel like I have to be doing several things at once. I need to have the babysitter come over and decide ahead of time what task I’ll be working on with the time. Hi Rebecca! If you haven’t tried it, I think block scheduling really helps with this! I was very hesitant for a long time, but I’m now a believer! Hi Heather! It looks like multi-tasking is definitely the biggest struggle for all of us! This will be very useful to me, I am a single mom and trying to start a business from my home so I can stay home with my kids, but I get so distracted while trying to accomplish things. I really need to work on not multi-tasking. It’s funny that we are told that multi-tasking is so important when it can really distract you from the stuff that NEEDS to be done. Thank you for sharing your experience. Thanks Cara! I wish you the best with starting your business! I agree with you on multi-tasking. I feel like we were taught for most of our lives to multi-task, and now they say it’s bad for your brain and productivity! Go figure! Great stuff here. Way encourage us all to be unstoppable at home! Cheers! Thank you, Rhonda! Cheers to you, too! Great tips! I love the comment about multi-tasking. It’s hard to truly multi-task. A lot of times I just end up with a frustrated infant and nothing accomplished. I’ve pinned this to a couple of my boards. Thanks Lauren! I’m glad you enjoyed it! My kids get the same way (understandably) which is when I realized I needed to make a big effort there. On the first of each month, I do a special round-up called #(Month)25 where I share the best of other people’s content with my followers. I share five posts from each of these categories: Christian, kids/motherhood, relationships, money, and miscellaneous. I just wanted to let you know that this blog post was featured in my #December25 Roundup. Hooray! Thanks so much Lauren! This just made my day! <3 I'm off to check it out now!